In the world of cookbooks, or perhaps it should be universe with new galaxy’s being discovered every day, how does one arrive at the ‘Cookbook of the Year’? Well, it’s largely a personal choice although subjective as this is, there is I feel a strong element of objectivity as the choice of chef and the contents of this cookbook is very much centred on what is a growing trend in our approach to food and the environment. I sense a palpable appetite for wholesome food and a return to classics and heritage cooking techniques, or even ancient methods and ideology. Central to this is the grand master chef, Philippe Mouchel, whose axiom not only goes back to his Normandy roots, but embraces many of the oldest and simplest cooking techniques known to man. If you have had the pleasure of dining at Mouchel’s latest restaurant in Melbourne, PM24, you will comprehend all this and taking pride of place is his theatrical open-plan kitchen is an impressively large and bright red rôtissoire that is the mainstay of the menu. And I quote “Rôtissoire cooking is one of the oldest cooking techniques and is such a natural way to bring out the flavour of the meat. 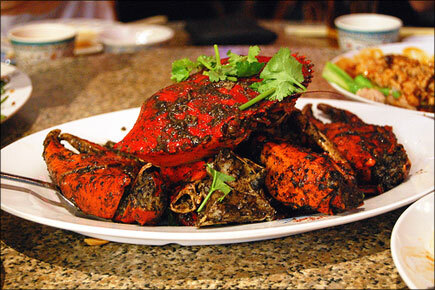 Spit roasting, with its gentle cooking and self-basting is for me the father of cooking”. Cardinal to this is Mouchel’s insatiable enthusiasm and emphasis on the freshest, locally-sourced, organic and wholesomely nutritious produce sourcing much of it from around Melbourne and within the state of Victoria. 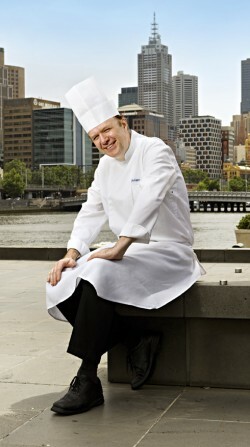 Australia is truly an incredible food bowl and clear motive for a great chef to become well and truly ensconced. And putting that into perspective, we are talking about of the most talented and respected French chefs in the world, not only a protégée of the legendary Paul Bocuse, but his right-hand man and executive chef responsible for steering many of Bucuse’s projects around the world. Bocuse discovered Mouchel when he visited Roger Verge’s Moulin de Mougins in Provence, the then young Mouchel chef de partie. Sensing great talent, Bocuse invited Mouchel to join his team at Collognes in Lyon and subsequently at the age of only 22, dispatching him to Japan to become chef at Rengaya, one of Bocuse’s overseas ventures. Bocuse then appointed Mouchel chef of his Hong Kong venture, Le Restaurant de France at the Meridien Hotel and also had him open the White Swan Hotel in Guanqzhou, China. He then became chef at Le Restaurant de France at the Le Meridien hotel in Houston, Texas, coming back to Asia as chef at Tokyo’s Belle Epoque. Bocuse then approached Mouchel to open the Paul Bocuse restaurant in the Daimaru department store, opening in 1991 which was the beginning of Mouchel’s entrenchment in Melbourne and Australia’s, both diners and the media embracing his rare talents in successive restaurant projects; Langton’s restaurant and The Brasserie by Philippe Mouchel. Mouchel has certainly fully assimilated to Australia much of this due to his jovial nature, and despite his commanding aura, cutting a giant figure accentuated by the tallest of torques, he is a most gentle, calm and humble individual (the antithesis of Gordon Ramsey in the kitchen) and you only have to be around Mouchel for a moment to be overcome by a sense of profoundness and an exuding confidence, wisdom, passion and assuredness that you just know you’re going to eat well. I was one of the first people Mouchel met when he moved to Melbourne, Australia to open the Paul Bocuse restaurant at Daimaru. A friend of mine was his relocation agent and asked me to introduce him to the French restaurant mafia, to which I assemble all the usual suspects for a long evening at Francophile headquarters, France-Soir bistro. This was to be the beginning of a very long relationship with Mouchel, working with him opening Paul Bocuse designing the entire wine program for both the restaurant and Daimaru department store wine boutique, the most challenging yet rewarding experience and achievement in my Sommelier career. You could say this cookbook has been ‘a long time coming’ or decades in the making and there are only a handful of chefs of Mouchel’s calibre and worldly experience that deservedly demand an audience in global sense in totally saturated cookbook market. More than French justifiably contains a good degree of autobiographical account of a chef’s journey yet this is approached modestly and tastefully, as one would expect of Mouchel. 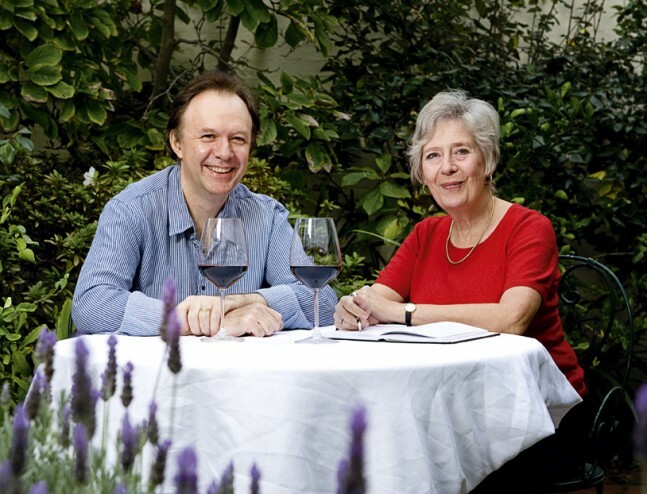 Mouchel has also astutely collaborated with Rita Erlich, one of Australia’s most respected food journalists, restaurant commentators and prolific food writer and author in co-writing this book. Indeed there lies the difference and extra merit of this user-friendly cookbook. No disrespect to all the great chefs out there who have cookbooks, but invariably these are cumbersome technical manuals, some with wonderful photography yet invariably have over complex recipes and methods that might be standard practice to cooking professionals but befuddle most amateur cooks. Erlich’s involvement is clear in the approach in format and layout of the book with ingredients and methodology meticulously and succinctly detailed combined with Mouchel’s firsthand narrative. Clearly there has been and enormous and painstaking effort in test cooking and translating Mouchel’s expertise and recipes to which Erlich has the requisite background knowledge and equal passion to do so eloquently and fluidly. Most pertinently, she comments, “His good humour shines through in everything he does”. And what makes the book, “More than French”? Well, notwithstanding Mouchel has cooked in more countries than most chefs would in their career, but clearly Japan his influenced him more than any other country, besides, he has a Japanese wife! Mouchel arrived in Japan in 1978, the first time he had left France moreover the first time he had been on a plane. Paul Bocuse was the first French chef to open a restaurant in Japan, partnering with a wealthy Japanese restaurateur, Mrs Inagawa. 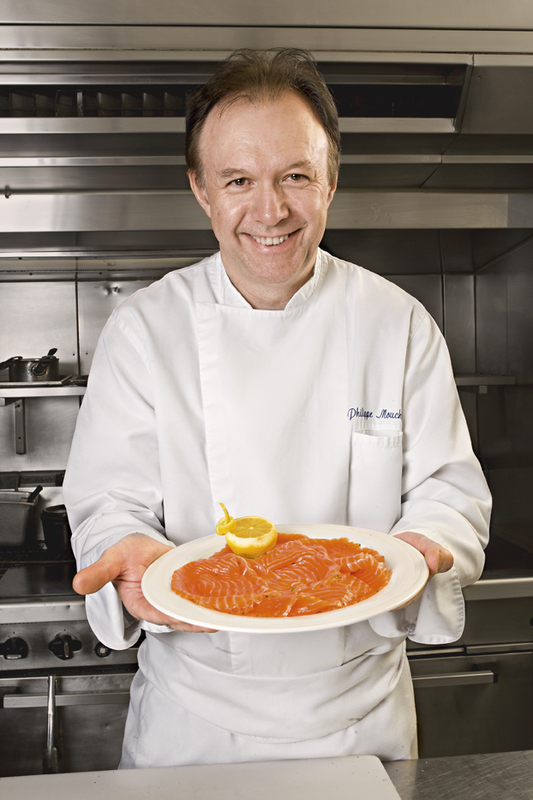 What Mouchel experienced in Japan, to his credit at a very early age, was how to adapt to a totally different country and culture, which unbeknown to him would instil a lasting ability to adapt recipes and ingredients to the local palate without losing the underlying French style, or more specifically, Paul Bocuse style of cooking. Inadvertently Mouchel was inventing modern French cuisine and with the combination of his stint in Houston, Texas, by the time he reached Australia he was well and truly an innovator and highly adaptive chef. Hence More than French incorporates some dishes with a Japanese flavour such as, ‘Japanese seafood omelette’, or ‘Vegetable miso soup’ and ‘Tomoko’s steamed snapper’ named after Mouchel’s wife. 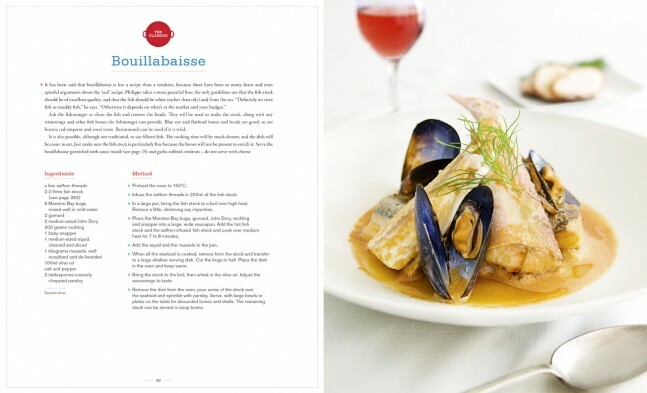 Many of the dishes are reflections of Mouchel’s travels and overseas postings such as ‘Wok-cooked chicken’ or ‘Quinoa salad’, but there is also many French classics perfected by Mouchel; ‘Salad Nicoise, Cassoulet, Pot-au-feu, Baouillabaise, Boeuf bouguignon, Creme Brulee to mention a few. Then there are Mouchel family classics with a thread of Normandy cider used liberally, ‘Raymond Mouchel’s French onion soup’, ‘Steamed mussels with apple cider’, ‘Grandmother Jeanne’s braised pig trotters’, or ‘Raymond Mouchel’s tripe with apple cider and calvados’. The meat section has my kind of speed, ‘Daube Provencale’, ‘Stuffed spatchcock and peas a la Francaise’, ‘Pork chops with prunes and couscous’, ‘Cocotte of pork belly and vegetables’, ‘Duck breast au poivre’ all have me salivating and then there’s the all-time legendary classic, ‘Truffle soup Paul Bocuse’. There is a strong dessert section, as Paul Bocuse remarks, “a complete chef” and particular strength of Mouchel who says “If I leave the table without something sweet, it feels like something is missing’. 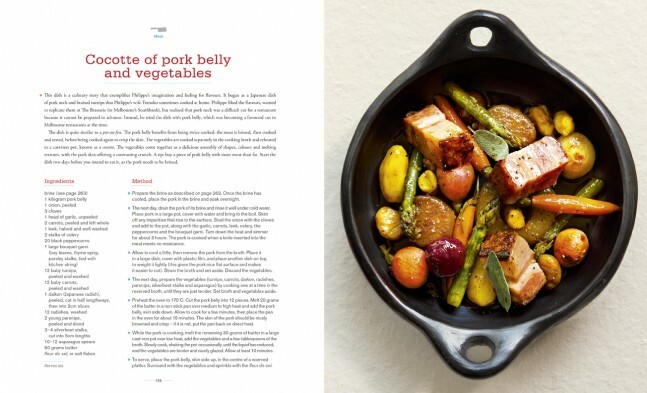 All the dishes and recipes exemplify the bounty of fantastic produce that Australia has to offer with the food photography arousing the senses and will motivate your hunter-gatherer instincts. In summary, this is a cookbook that you use constantly both in day to day cooking and as much entertaining and planning gourmet meals, no matter where you live. It will make for a wonderful Christmas present for gourmands enthusiasts and you’re every day cook alike. 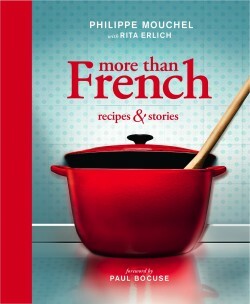 More than French is published by Slattery Media, ISBN 9780980744729 and available direct www.slatterymedia.com or through your favourite bookstore.